Butternut squash soup is always great, but truth be told, it sometimes feels a little on the boring side to me. I make a simple pot of it every now and then, with just the squash, a little onion and carrot, veggie broth, salt + pepper and a quick turn of the immersion blender. But if I want to do something really special, I make this soup. The combination of butternut squash, potato and leek is just delicious. I think it really takes butternut squash soup to the next level. The texture is so velvety and the color is such a pretty autumnal yellowish-orange. I want a scarf the color of this soup. If you’re thinking of making some toasted baguette slices with melted cheese to have on the side of this soup, that’s a good idea. Soups need dippers, right? Arrange slices of baguette on cookie sheet, top with shredded cheese and pop ’em in the oven on a high temperature for a few minutes until the cheese melts. The flavors of this particular soup go really well with Gruyère cheese, but parmesan also works if that’s what you happen to have. 1. Prep all of your veggies. 2. Heat butter in large soup pot. Add the squash, potato, and salt + pepper. Cook for about 10 minutes. I usually look for a little browning to happen and some color to develop on the bottom of the soup pot. Then, add the leek. Cook for a few more minutes. 3. Add the stock, stirring to scrap up any bits on the bottom of the pan. Bring the soup to a boil, then simmer until the veggies are soft. This usually takes about 20 minutes. 4. Remove the soup from the heat. 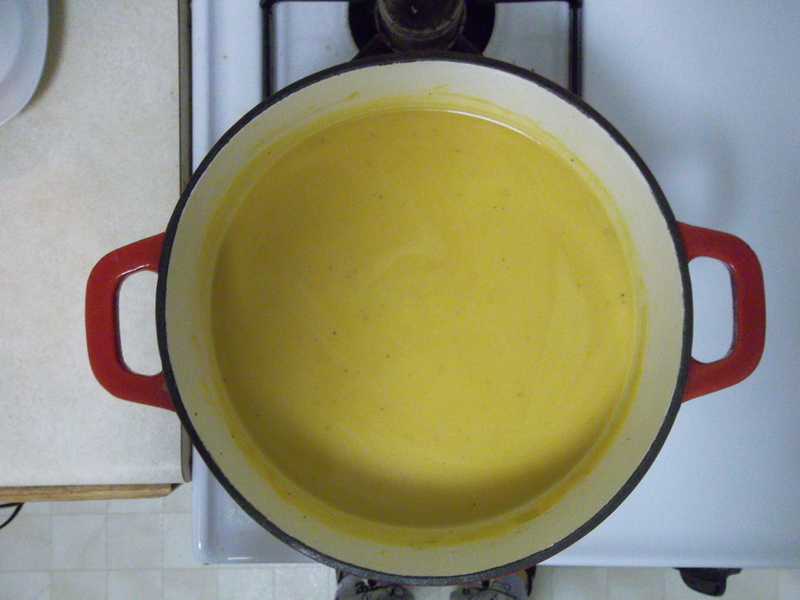 Use an immersion blender (or transfer to a regular blender) and puree the soup. Add more stock if you need to adjust the consistency. 5. Return to a low heat and stir in the milk. Enjoy! Categories: butternut squash, easy, Fall, leek, potato, soups | Tags: butternut squash, easy, Fall, leek, potato, soup | Permalink.